While working out might not be the number one factor in shedding pounds, it’s vital for so much more than weight loss. Not only do the benefits of exercise include feeling happier and boosting energy levels, but it’s a proven way to reduce the risk of chronic diseases and cancer — who doesn’t want that? Today, chronic diseases are the most common, expensive and, critically, the most preventable of all health problems. (1) In fact, heart disease and cancer, both considered chronic diseases, accounted for 48 percent of all deaths in the United States in 2010. Frankly, that is an incredible number. And the fact that there is way too much sitting in our lives and we’re more sedentary than ever before doesn’t help. 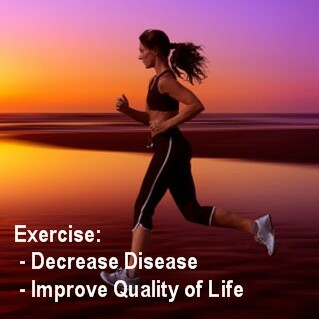 (2) But research shows that exercise actually fights disease in an all-natural way that can sometimes rival medication. Let’s dig in. So what actually happens to your body when you exercise? As it turns out, a lot. And some of the world’s leading doctors are paying attention. In a 2015 report, the Academy of Medical Royal Colleges, a consortium of 21 medical institutions in the United Kingdom and Ireland, called exercise a “miracle cure.” (3) So why is it exactly that exercising makes such a massive impact on how your body fights disease — what exactly happens when you get up and get moving? For starters, your body demands glucose, or stored sugar, to give it energy. It also requires adenosine triphosphate, or ATP, to keep going. Because our bodies store limited amounts of both, we need more oxygen to create more ATP. More blood starts flowing to your muscles to provide them with the oxygen boost they need. To get that oxygen circulating, your heart rate will quicken, enabling your body to circulate blood more quickly and efficiently where it’s needed. And because the human body is awesome, the more you exercise, the better your heart becomes at getting that oxygen around speedily. Keep at it and you’ll notice that an exercise that once wiped you out is now a lot easier — plus, your resting heart rate will go down. With all that blood swirling around, some of it is sure to go to your head. That’s actually a good thing. It gets your brain cells fired up, making you feel more energized and alert. You know how you might be exhausted before starting a workout and by the end, you’re feeling pretty peppy? Yep, thank your brain for that. It’s also releasing neurotransmitters like endorphins and serotonin, giving you that post-workout high. Knowing that all of this is happening concurrently is pretty cool. But how does it actually help fight or prevent disease? I’m so glad you asked. How Much Exercise Do You Need to Experience Health Benefits? Are you worried you’ll need to go from couch potato to marathoner? Not so fast! You don’t actually need a crazy amount of exercise to reap all the health benefits. The American Heart Association recommends 40 minutes of moderate to vigorous exercise three to four times a week to reduce the risk of heart disease and stroke. Remember, that’s 40 minutes total — you can split it anyway you’d like. Turning to high-intensity interval training workouts is also a terrific option. HIIT workouts beat conventional cardio by delivering the same physical benefits in a shorter amount of time, usually 20-30 minutes. If you have a difficult time making time for exercise, HIIT and tabata workouts can easily be squeezed into your day. But it’s OK if that’s not your thing. The key is finding out what is. If you enjoy swimming, hit the local pool a few times a week. Take your dog on a brisk walk after dinner. Try some vinyasa yoga classes or a fun group fitness workout. If you love to cycle but want to do it in the comfort of your home (and if it’s within your budget) consider checking out and investing in a Peloton bike. Anything is better than nothing, and finding a workout you enjoy will ensure you keep at it regularly. The opportunities are endless! Of course, there’s another very real reality. For many people who are already suffering from certain condition, these sorts of vigorous exercises might not even be an option. If you’re experiencing serious pain, fatigue or other ailments from chronic disease, getting out of bed might be an achievement, never mind running miles at the gym. If that’s the case, don’t give up on exercise. Work with your doctor or physical therapist to design a program you can do. Can’t walk a mile? Try walking around the block. Tai chi can be a good way to tap into the mind-body connection even with limited mobility.